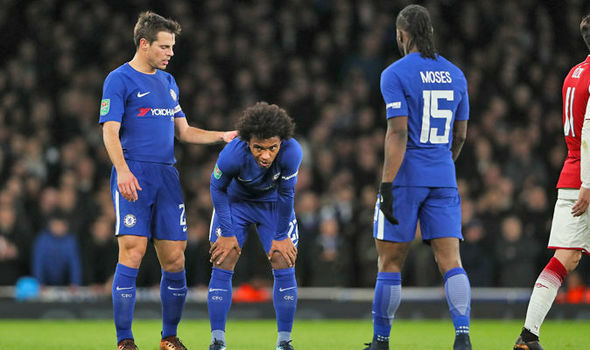 There is strong indication that Juan Mata could be on his way out of Manchester United with Chelsea’s mercurial midfielder and long-standing target Willian set to replace him at Old Trafford. It’s common knowledge that United coach Jose Mourinho has made several attempts in the past few seasons to lure the Brazilian and Chelsea star Willian to Old Trafford, last summer negotiations reportedly took place with the player’s representatives. With Chelsea having a terrible season and almost out of the running for a top-four finish which would have guaranteed Champion’s League football next season, Manchester United are confident they could convince Willian to make the move in the summer. Willian’s Stamford Bridge contract does not run out until 2020 and Chelsea would certainly demand nothing less than a £30million fee which is the same price they paid to bring Willian to Stanford Bridge from Shakhtar Donetsk five years ago. Jose Mourinho is planning a big shake-up in United’s team set-up as he plans to build a side capable of challenging Manchester City for the title next season. Juan Mata, who will be 30 this month, was signed from Chelsea for a then club record fee of £37.1m in 2014 and he has gone on to make 182 appearances and scoring 39 goals for Manchester United, his stats are pretty impressive, which means there will be no shortage of suitors for Mata in the transfer market. Juan Mata has struggled to command a regular starting spot under Jose Mourinho since his arrival at Old Trafford, the Spaniard’s Old Trafford contract expires at the summer after the club activated a clause in the contract to add an extra year. ” Once you are part of this club, your football career is not the same; it changes because this is one of the biggest clubs in football history. “Every day I try to tell myself how lucky and how privileged I am, try to take advantage of every single training session, and try to see how important it is to be a Manchester United player. It remains to be seen if Victor Moses will still have his close pal Willian with him in Chelsea at the end of the summer.